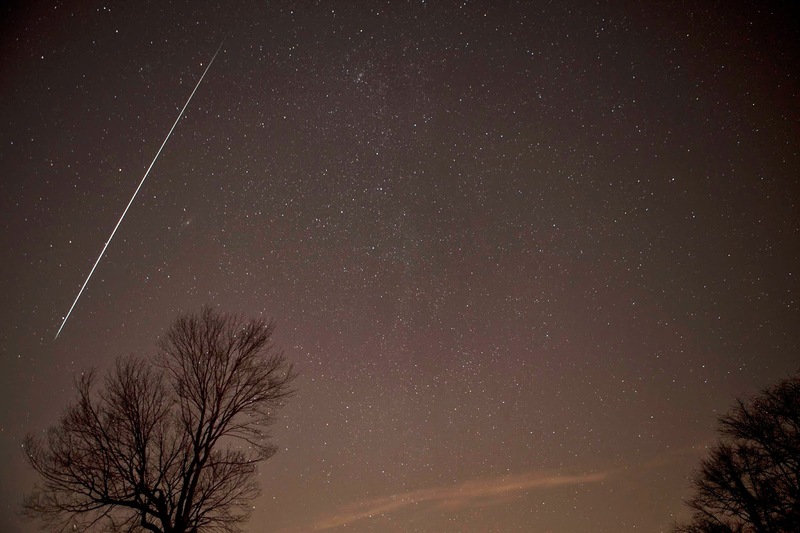 Last night there was a meteor shower. And all the shooting stars reminded me of a powerful lesson. I went outside around 1am, my StarWalk application in tow, and checked to make sure I knew where to look in the sky. StarWalk had the meteors shooting just to the left of Jupiter and a bit lower in the sky. This was a good thing and bad thing. The good thing is that my view is relatively clear in that region of the sky. The bad thing is that, while only a half moon, the moon was very bright last night and positioned beneath Jupiter when I was out there. Ideally, you want a darker sky. Anyway, I got myself all comfy and glanced casually out where I was supposed to look. I didn't want the shooting stars to think I was desperate or needy or anything. There were supposed to be as many as 50 per hour, so I thought it was going to be like shooting fish in a barrel. But after about 15 minutes, I saw nothing. So then I decided to stare squarely at a point in the eastern sky, unblinking, as long as I could. Still nothing. By now, about a half hour has passed. I tend to see stuff in the corner of my eye, so I think I might have seen something, but there was nothing conclusive. So then I figured that maybe the moon was just too bright and they were too close to where the moon was in my field of vision to be seen. So I laid back and looked at all the stars directly overhead. It was a beautiful sight. Within seconds of laying my head back, however, I saw the most spectacular shooting star make a long, lingering arch across the sky. No doubt about it. I saw one! But before I was done making my wish, I saw another! Then another! Seems that all that time, I had been looking in the wrong part of the sky. I had limited myself to what I knew—or thought I knew—about the Geminids meteor shower and I invested fully in that knowledge. But that knowledge turned out to be fruitless. I didn't see a shooting star until I put aside what I knew and looked at the sky from another perspective. We see this all the time, don't we? We even do it ourselves. We're so sure of something—so invested in our perspective being right—that we see it as the only way. But looking at things from another perspective doesn't have to mean you're wrong. It just means you're broadening your view of something. And as long as you hold on tightly to what you "know", you may be cheating yourself out of something quite special. Just to apply it to a situation, there's a lot of talk about racism and police violence going on these days. Among the things people "know" are a) the details of every police interaction that resulted in the death of a black man that has happened recently, as if they had witnessed it themselves, b) how black men should respond appropriately when confronted by the police, c) whether or not racism exists, and d) whether or not white privilege exists. Some of the things I see when I look at these debates is that there is definitely a dialogue that needs to happen and voices that need to be heard on this topic. For a large part of my life, I have felt the tension...the elephant in the room that we don't really talk about. Everyone has been quiet so as not to stir up crap and upset whatever balance has existed since the late 60s and early 70s when discussion of race were topmost in peoples' minds. For the most part, we all got back to a comfortable place, but clearly, it wasn't that comfortable. Or balanced. Or we wouldn't be back to where we were in the early 70s. Or in the early 90s with Rodney King. What I see is that we have these discussions, we don't agree, we don't make much progress, then we all get quiet again. And both sides go back to the way they were before, neither side seeing their role in the continued tension. What I also see is a bunch of white people in various stages of "not understanding" why all this is happening. We say things like "when the police approach you, just say yes sir and no sir and be polite." Or we say, "there is no racism in this country. There is no white privilege." Or we insist there's not a trace of racism within us or anyone we care about. When we say these things, it's like we're looking directly below and to the left of Jupiter in an attempt to see the shooting stars. Because we're only seeing things from the perspective we know and the perspective we know is that of a white person. And that is why we never solve things. That is why every 20 years or so streets break out in riots and the country talks about racism and white privilege. Admittedly, I see way more people "getting it" these days. But it works both ways. For every white person looking below and to the left of Jupiter, there's a black person in this debate doing the exact same thing. Then there a whole bunch of people in the middle showing some understanding for what it's like to be a policeman and some for what it's like to be a black person in this country. IMO, we've come a long way in my lifetime in regard to this, but still have far to go. But that's my view as a white woman. I can't possibly speak for black people. No matter how hard I try to understand the perspective of a black person, I will always be lacking, because I've never had to live it. And, again, the reverse is also true. I didn't write all this to start a debate, though it might. I wrote it to illustrate how we tend to keep to a particular part of the sky when it comes to race relations, politics, squabbles with friends...pretty much everything in life. We invest in a perspective and ride it for a lifetime. Then we wonder why certain things never change. How can they if we're not willing to broaden our view? The truest thing I know about life is that none of us holds the truth about anything. We hold just one piece of the truth, a piece viewed from our unique viewpoint. But staring at and knowing and being certain about your part of the cosmos doesn't mean you understand the cosmos. The next time you're sure of something, remember that the magic comes not from being certain, but from opening yourself up to a part of the sky you never thought to look at. That's where the streaks of new enlightenment can be found, arching their way across the sky.